With this new NFC/RFID on chip all NFC/RFID enabled devices like smart phones or tablets or RFID readers can read and write to the chip. The chip is a NFC/RID tag on ISO/IEC 15693 that you just solder on your PCB. The NFC/RFID antenna could be a PCB track, a SMT mounted coil antenna, a structure made by laser on your plastic enclosure or a customized wire loop antenna. About NFC/RFID antennas on 13.56 MHz we will tell more in another story later. 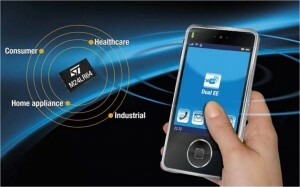 The chip does not just contain the NFC/RFID transceiver – it contains an EEProm as well. The EEProm (4 KB, 16 KB or 64 KB) can be by accessed by NFC/RFID or wired bus (I2C). You can select which memory banks can be written by radio or I2C or both communication channels. Based on the two communication channels you can pair your WIFI, Classic Bluetooth, Bluetooth Low Energy, ANT+ or any other wireless link easy. Nevertheless, the EEProm can be used for setting parameters like communication language in the display of your M2M device easy as well. You can set the parameters without opening the enclosure. This is e.g. 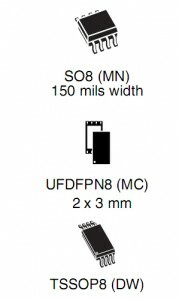 a very helpful feature for IP65 or IP67 protected M2M devices, but helps to save time for screwing or helps to save a USB connector at your enclosure. You can get ready to use NFC/RFID readers/writers, reference designs for own NFC/RFIF readers/writers, cheap smart phones like the Samsung S3 mini or several Android tablets. List of NFC phones is published here http://www.tagonic.com/supported-devices . Last but not least the chip offers an energy harvester. One pin can be used to drive or charge your M2M device. It also can be used for wake up on NFC/RFID radio as well. The NFC/RFID on chip is available with an evaluation kit that contains the chip wired on a PCB including an 8 bit microcontroller, a temperature sensor or a display and the NFC/RFID antenna. The same evaluation kit contains an NFC/RFID reader/writer as well. Both PCBs are very well documented and ready to copy and redesign. For Android phones a free of charge app is available. That means you can use the reader/writer with demo software on your Windows PC or the Android phone to access the chip. 1) The M24LR board is battery-less and powered by RFID readers or NFC-enabled phones supporting ISO/IEC 15693. 2) The RF transceiver board is an RFID reader demonstration board and is composed, among other parts, of a CR95HF (13.56 MHz multi-protocol contactless transceiver IC with SPI and UART serial access). This board has to be plugged in to a PC and comes with demonstration software. The M24LR board also works with Android NFC phones supporting ISO/IEC 15693. An application called NfcV-Reader is available on Google Play. Performance may vary depending on NFC phone’s RF management.